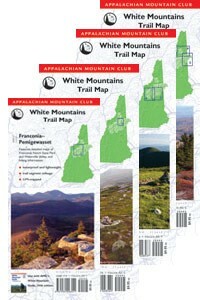 AMC White Mountains Trail Map Set, 2017, cartography by Larry Garland. This four-map set covers every trail in the White Mountain National Forest and adjacent areas and has been fully revised for the 30th edition of the AMC White Mountain Guide. The maps are made of durable and waterproof tyvek. The trails have been GPSd, so these are the most accurate maps available. They also have the popular "mileages between points" feature. Includes the following: Map 1: Presidential Range This is a larger scale map (1:42,240) of the Presys. On the reverse side is a large-scale inset of the Northern Presidentials along with general hiking info, phone numbers and resources. Map 2: Franconia/Pemigewasset This 1:79,200 scale map covers the Pemigewasset Wilderness and Franconia Notch regions, along with the western half of the Kancamagus Highway. On the reverse are larger-scale maps of Franconia Notch, Crawford Notch and Waterville Valley.. Maps 3 and 4: Crawford Notch-Sandwich Range and Moosilauke-Kinsman. Map 3 covers the Sandwich Range, eastern Kancamagus Highway, eastern Pemigewasset Wilderness, and Bartlett-Crawford Notch area. Map 4 includes the western Pemi, Franconia Notch, Kinsman Ridge, Moosilauke region, and the southwestern Whites. Both are at 1:79,200 scale. Maps 5 and 6: Carter-Range-Evans Notch and North Country-Mahoosuc. Map 5 covers the Carter-Moriah Range, Baldface/Evans Notch, Caribou-Speckled Wilderness, and North Conway region. Map 6 includes the Kilkenny region, Crescent Range and the Mahoosucs. Both are at 1:79,200 scale.